The amazing Hydrangea that everyone is talking about!! Forget those dull seaside displays of blues and pinks, 'Miss Saori' is something different. And this was recognised when she won the Best Plant 2014 at the RHS Chelsea Flower Show. Such has been her popularity that stock is very scarce indeed, but we have secured just a few hundred of these sought-after plants for our customers again this year. So what is all the fuss about? Well, each flower is fully double, which is unusual for Hydrangeas. To top this, each petal looks sugar-coated with lipstick pink edging, fading subtly to the centre, creating a wonderful effect when the huge flowerhead is seen. 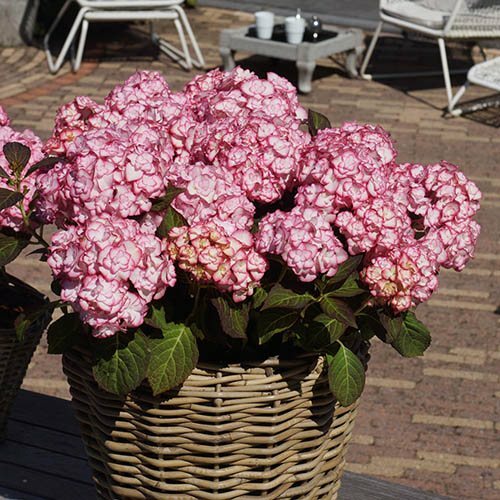 Bred in Japan by the world's premier Hydrangea hybridiser, 'Miss Saori' also repeat flowers, as she flowers on both young and old wood - this removes many of the conundrums of pruning, making it easier to manage, and longer flowering than conventional types. As if this was not enough, as cooler autumn approaches, and the final flowers blossom, the leaves turn burgundy purple, presenting the perfect foil for the flowers. Be one of the very few who can grow this so early in it's life, it is set to be an exceptionally successful variety. Supplied as a branched plant 15cm tall in a 9cm pot, to plant straight out.